Kale is a great leaf for salads. 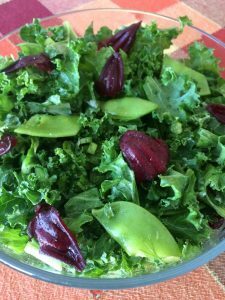 The tough exterior softens when it marinates and kale salad tastes even better the day after you make it. I always look forward to leftovers for lunch. This week I threw in some fresh snap peas and roselle petals. You could add toasted and chopped nuts or seeds, fresh herbs, eggs, meats or cheeses. Kale salad is just too easy. Try different dressings too. Sesame oil with ume plum vinegar, balsamic and olive oil, avocado oil and champagne vinegar. Honey, mustard or soy sauce make good binders. To prepare kale leaves for salads, remove the stem. You can hold the end of the stalk between your fingers and swipe your other hand down the stem towards the tip. This will help you remove the leaves in a single swoosh. Cut the kale leaves into bite size pieces and thinly slice the stems. Whisk vinegar and honey. Slowly add oil. Toss kale in marinade. Add your favorites and enjoy now or later.